Has been one of those dismal winter weeks, with the fog and frost not lifting on some days. Has given us chance to catch up some indoor work, like painting the delphinium supports dark green so they do not show as much as bare metal. Tony got this choice job, and Barbara and Debi spent one morning giving our restored Victorian vinery a good clear out. 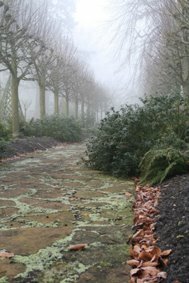 As the photo shows, it is a good month after Christmas, and the leaves are still falling off our Copper beech tree onto the borders. It seems unusually late for them to still be hanging on, even after the cold and windy weather of late, they are only leaving one by one. Keeps the gardeners busy clearing up though! Rachael is our WRAGS (Women Returning to Amenity Gardening Scheme) trainee for this year, and started in October. The scheme is run by the Womens Farm and Garden Association (WFGA). Today she got stuck into removing an old overgrown ceanothus which was smothering a lovely shrub rose near the entrance gate. On a chilly morning its also the quickest way to warm up and start removing the layers we are all bundled up in. Once the bulk had been removed, I am sure you could hear the rose breathe a sigh of relief, as fresh air wound its way around the stems, blowing away the cobwebs (along with any bugs and diseases hanging around). 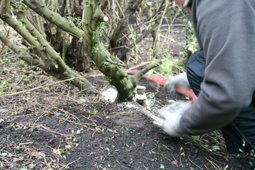 Another year starts in the garden, and on one wet Tuesday afternoon, the gardeners set about remaking the hazel supports for the ornamental veggy, herb and cutflower garden, otherwise known as the potager! We selected lovely, straight lengths of hazel growing along our nut walk, each about 6 feet long, and colourful stems of cornus and willow. 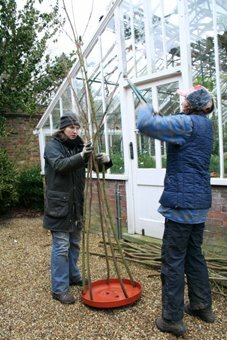 The next part was a four-handed affair of holding the long hazel stems together whilst twining the cornus and willow around to hold it all together. After trying three horizontal loops of cornus, the consensus was to increase this to five, and the supports were indeed much sturdier as a result. The resulting supports were put in place in the deserted winter potager ready to be smothered in the summer with sweet peas, spaghetti squash and purple pods of mange-tout.